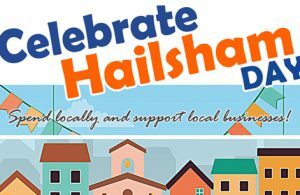 It’s just days away now until townfolk can take part in Celebrate Hailsham Day, which will be making a comeback on Saturday from 9am to 3.30pm. Organisers are pleased to be working with the town centre shops once again, many of which will be offering discounts off their goods and special promotions on the day. Celebrate Hailsham Day will also feature a wide range of stalls in Vicarage Field, selling a range of locally sourced food, gifts and accessories. Hailsham Parish Church will be holding an open church, where free refreshments will be available. Organisers are pleased to be working with the town centre shops on the event, many of which will be offering special discounts off their goods and various promotions on the day. Hailsham Town Council is also organising a Summer Market (with the support of Hailsham Forward), which will take place on Saturday 28th July, at which Vicarage Field will be home street market stalls and there will be live music throughout the day from El Banda Burros (1pm-2.30pm) and the Peter Willson Jazz Quartet (10am-10.45 am and 11.15am-12pm). Harvey’s of Lewes will be providing a beer tent and selling wines, plus Hailsham FM will be broadcasting live at the event and there will be free face painting available for children, courtesy of Christchurch. For further information, please contact Karen Giddings on 01323 841702 or by email: karen.giddings@hailsham-tc.gov.uk.